If you're in the market for a midsize crossover these days you’re absolutely spoiled for choice. But choice is a lot more restricted if you want something midsize that actually has the off-road capability of a genuine SUV and isn’t just designed purely for the pavement. Of course, you don’t need a great deal of choice if the options you're presented with are seriously good, which is why it's a good job we have the 2018 Toyota 4Runner. So, let's take a look at what this enduring midsize SUV has to offer today. A new Toyota 4Runner doesn’t look like something off the set of the latest sci-fi blockbuster, but it doesn’t look like a small military vehicle from a WW2 movie either. It's definitely more SUV than crossover with little or no attempt made to hide its truck-based underpinnings. It's not overtly curvy, but it's not two boxes on four wheels either. The 4Runner strikes a great balance between traditional SUV and modern truck, and it's a design that probably won’t date significantly for a very long time. If you want a vehicle to keep for a decade or more that won’t look out of date two years in, the Toyota 4Runner is going to be hard to beat. If you're going to spend 99 percent of your time around the town or the city there are other models in the Toyota range far more suited to your particular requirements. 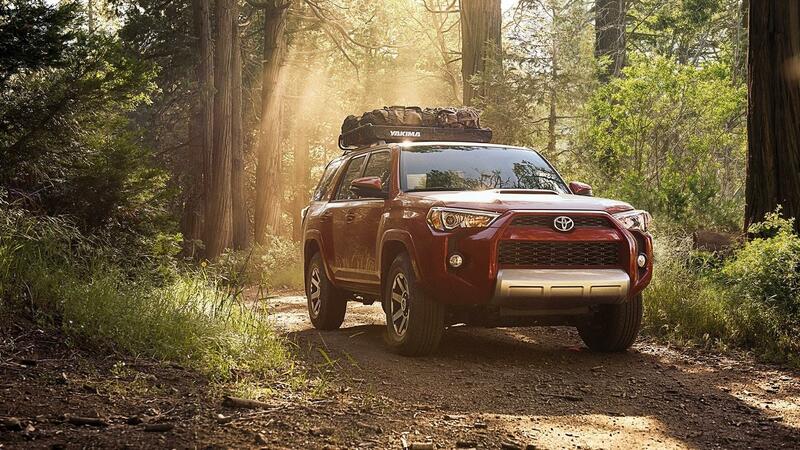 While the styling of many crossovers writes off-road capability checks their drivetrains can't cash, that's not the case here with the 4Runner. Toyota knows this model is going to be used differently to a RAV4, which is why it's built and equipped differently. There's just one engine in the range, but it's a pretty strong one in the shape of a 4.0-liter V-6 that puts 270 horsepower and 278 lb.-ft. of torque at your disposal. Rear-wheel drive is standard with four-wheel drive available with SR5 and Limited trims, although off-road focused TRD models are unsurprisingly 4x4 as standard. The four-wheel drive system is really what the 4Runner is all about, so it's actually a little hard to see the point of choosing one with rear-drive. There are currently six different trim levels of 4Runner, which are the SR5, SR5 Premium, TRD Off-Road, TRD Off-Road Premium, Limited and the TRD Pro. Entry level models come with a standard power driver’s seat, a rearview camera, a 6.1-inch infotainment system, an eight-speaker stereo and 17-inch alloy wheels. Go up a grade to the SR5 Premium grade and it then gets you synthetic leather upholstery, front seat heaters and satellite navigation. TRD models are where the off-road capability really kicks in with features including a locking rear differential, Crawl Control, and more modes for the traction control system. 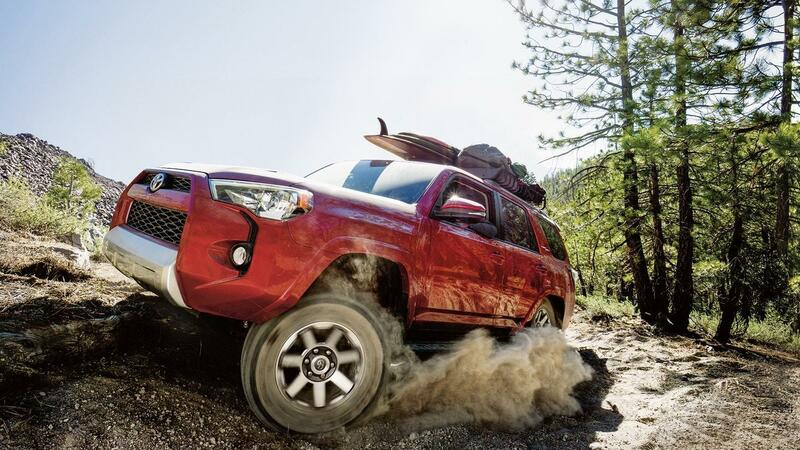 Toyota’s Kinetic Dynamic Suspension System is an optional upgrade with beefy sway bars that disconnect automatically for off-road use, and it's highly recommended if you are serious about your off-roading. You'll need to be ok with climbing up to get inside the Toyota 4Runner, but once you're in you'll find it was definitely worth the effort. The cabin certainly isn’t rough and ready by any means. The fit, finish and comfort of the 4Runner interior is admirable at all levels, and all three coverings of fabric, synthetic leather and real leather are excellent. Perhaps the best option for all occasions is the synthetic leather, which as well as looking and feeling nice is also impressively durable. The third-row seating when optioned is pretty small, so most buyers stick with the five-seat configuration which then means a very useful amount of room for cargo. When you want to check out a 2018 Toyota 4runner for sale in Watertown, look no further than right here at Waite Toyota and get in touch today for more information and to arrange a test drive in the sensational Toyota SUV.